Athletes often ask me several different questions when it comes to Power vs. Heart Rate training (HR). “Why do I need to train with power?”, or “Isn’t HR training just as effective?”, or “Wouldn’t I want to use HR instead of power due the fact that my HR will reflect how I’m feeling?” These are all important and common questions in the cycling community. HR alone isn’t going to give an athlete the best results. The combination of power and HR is the optimal way to know exactly how an athlete is performing. Power is the most effective and accurate training method available to cyclists and this is why. When I think of the comparison of power (watts) training to heart rate training, it makes me think of trying to read a book while watching the Super Bowl. You may be asking, why would anyone read a book during the Super Bowl. Well, imagine there are thousands of fans yelling and screaming around you. You’re reading the words of the book and some of it sinks in, but a lot of time was spent trying to focus on the task at hand. This is my idea of training with HR. You’re doing the work, but you’re limiting yourself and what you’re getting out of it is marginal at best. Training with power is reading that same book, in a quiet room with no distractions, after taking an extreme dose of Ritalin. You can focus the specifics of your training to exact measurements. Watts don’t fluctuate, a watt is a watt. But, HR is based on how an athlete feels, how they have slept, how much caffeine they drank, and if their body is fighting a cold. HR is also reactive versus instant. Meaning, that HR has a delayed reaction to the effort being applied. So, what happens when an athlete’s HR is up or down? What does that mean? The only true way to figure that out is having a power meter. Better results are found after knowing what the body is able to output, not basing training on the intake. Power takes out the variables, and eliminates the guess work. Power is instant, and gives results immediately on how much work is being applied. This is important for a few reasons. 1. When doing an interval, the moment pressure is applied on the pedals, it will show immediate feedback. HR can take upwards of a couple minutes to react to effort, and in doing so could cause a much higher effort than the interval was trying to accomplish. At this point, the targeted adaptation was lost. 2. During an interval, power will help identify if the proper amount of effort is being applied or if the athlete may be over trained. 3. HR is reactive and could take thirty-seconds or more to react when force is taken off of the pedals. So, technically an athlete could have mini recoveries in their interval and still stay within the HR zones of the target interval. With power, it records every stroke of effort or missed opportunities to push through the pain. Another item to pay close attention to in this graph is how long it takes for the HR to catch up with the effort. In order to see this more clearly, Graph 2 is zoomed in on the first 2 minutes of Graph 1 during the athlete’s first interval. 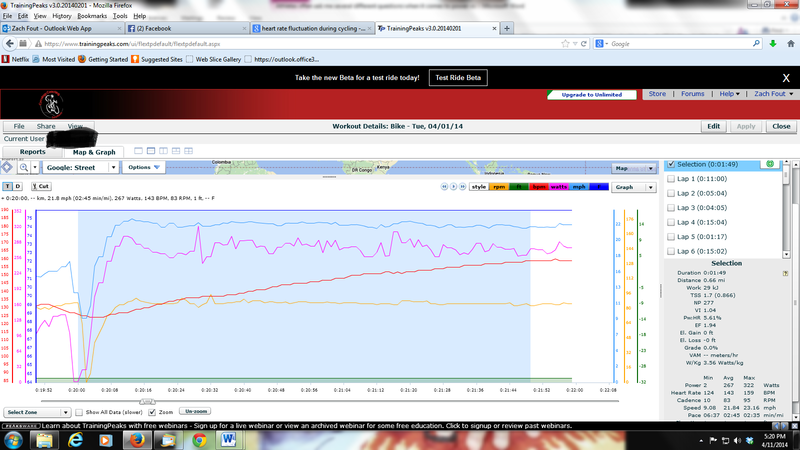 You can see how the power is instant (pink line) and the HR (red line) takes 1:47 seconds to catch up to the effort. This graph depicts how an athlete could easily go out too hard in the beginning without power. After the athlete completed multiple intervals, his body was no longer as efficient and was working harder to produce the same power. If you’re training with HR, the residual from the previous intervals will show up. This will cause less power to be applied to each interval if the HR is to stay in the targeted zone. To achieve the adaptation effect of the intended interval, the same amount of work will need to be applied during each interval or it will not have the targeted effect intended. Setting up training zones with HR, power, or preferably both are the most effective way to train. After establishing HR zones they don’t fluctuate much. The only true way to know if the training is working and if the athlete is getting stronger would be if they’re getting faster. But if the conditions aren’t as exact as the first test, then the data will be inconclusive. For accurate test results, the variables must be consistent. When testing and setting up training zones with power, it’s easy to see if the training that the athlete is doing is working or not. Find an area that the test can be repeated with minimal variable changes. At the end of each recovery week, retest and compare the results. If the athlete is working to improve their 20 min. effort, then retest that same 20 min. effort over the same terrain. If the previous test averaged 300 watts, for 20 min. of effort a month ago, and the new test results showed 310 watts, for 20 min. effort, the training is working and the athlete is getting stronger. Re-testing is easy and accurate, and variables like wind are no longer a factor since power will detect the exact effort (watts) being applied to the pedals. Eliminate the wasted time and guess work by only training with only HR and incorporate power into your workout. Training with power will give higher performance gains in less time, which in turn, will help identify causes of concern by providing a baseline that allows all other areas of data to reference. Don’t be that guy trying to read a book at the Super Bowl. Focus on the specifics of your training with exact measurements. Train with power, get results. If you have any questions, check out my website www.cycologycoachingsolutions.com.